The Deputy Commissioner is the Chief Revenue Officer as District Collector and is responsible for collection of Revenue and other Govt. dues recoverable as arrears of Land Revenue. He deals with the Natural Calamities like drought, unseasonal rains, hailstorms, floods and fire etc. Under the Registration Act the District Collector exercise the Powers of Registrar of the District and he controls and supervises the work of Registration of deeds. He also function as Marriage Officer under the Special Marriage Act, 1954. Further under the Cinematography Act, the District Magistrate is the Licensing Authority in his jurisdiction. The administration of the Police in a district is vested in the Superintendent of Police, but under the General direction of the District Magistrate. The District Magistrate is the head of the Criminal Administration of the District and the Police force is the instrument provided by Government to enable him to enforce his authority and fulfill his responsibility for the maintenance of Law & Order. The police force in a District is, therefore, placed by Law under the General control and direction of the District Magistrate, who is responsible that it carries out its duties in such a manner that effective protection is afforded to the public and against lawlessness and disorder. District Magistrate is thus responsible for the maintenance of Law & Order within his jurisdiction. He is conferred with very wide powers by the law, which if used prudently can be very effective in maintaining peace and tranquility. He can impose restriction on the movement of unlawful Assembly under Section 144 Cr.P.C. and can also impose curfew keeping in view of the situation. 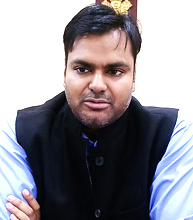 He is authorized to inspect the Offices/ Courts of Sub Divisional Officers (Civil), Treasuries, Sub Treasuries, Jails, Hospitals, Dispensaries, Schools, Blocks, Police Stations, Second Class Local Bodies, Improvement Trusts and all other offices of Jharkhand Government. In this way, he has effective control over the Administration.